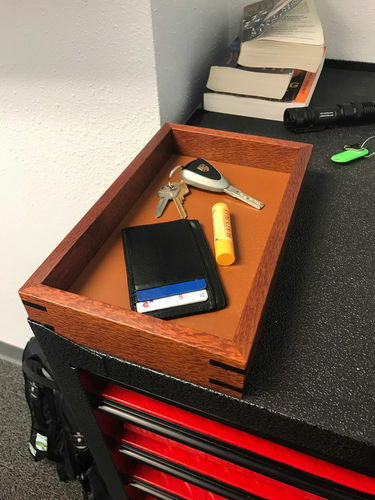 This is a valet tray my son asked for to toss his keys and wallet into at his desk. He’s 23, and managing the redevelopment of a large number of buildings in TX. Quite a guy. I’m very proud of him. I build lots of these little projects, and i guess I should post more of them here. They are small, simple, and a nice diversion from the residential doors that take up much of my time. This is made from lacewood, and the corner splines are wenge. The base is covered with a 2 oz split of pig skin. It’s dyed with Transfast medium walnut dye and top coated with several coats of Mohawk pre-cat lacquer. Can you explain why you chose pig skin? Thanks, Tung. The wenge was some scrap that I thought looked good with the lacewood. I really love the lacewood. My local dealer had it labeled as low-figured leopard wood. It’s quarter-sawn, and the edges do look a good deal like leopard wood, but looking at photos, I think it’s lacewood, which is in the same family. Regardless, it was $3.60/bdft after my discount, and at that price, they can call it whatever they want. kipibenkipod — Thanks for the compliment. The choice of pig skin was pretty much due to what was available that worked. If you’re not familiar with leather, its thickness is measured in ounces, and one ounce = 1/64 of an inch. For a box like this, I wanted to keep it down below 3 oz, so that limited my choices at the leather store to begin with. I didn’t want faux exotics, and I had a narrow range of colors I was interested in, and only this split was the right combination. It just happened to be pig skin. If it had been calf, or something else, that wouldn’t have mattered — it was the thickness and color I wanted. That said, pig skin is extremely durable. For a box like this, calf would eventually get scratched. Pig won’t. You can drag your fingernails down this leather and it doesn’t leave a mark. It doesn’t stain easily either. Update: My son sent me a photo of the tray after he received it today. Looks even better with a Porsche key in it!